In 1716 Carl Linnaeus, who was born in 1707, was enrolled in Växjö School. He is said to have had a limited interest in schooling. What meant a great deal to his development was the headmaster of Växjö School, Daniel Lannerus. He had a great interest in botany. Carl got to accompany Lannerus on excursions, and Lannerus realized the boy’s aptitude and interest in natural science. He related this to his friend, a senior master and provincial physician named Rothman. Dr. Rothman was also impressed with Carl’s interest in and knowledge of botany. There is reason to believe that Carl’s thoughts about a medical career were sparked by his contact with Dr. Rothman. 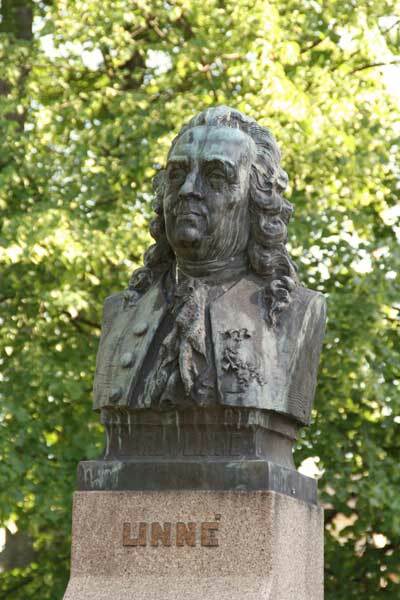 Linnaeus bust in the park in Växjö. After a while Carl started upper-secondary school. Theology dominated the curriculum. The prime purpose of upper-secondary school was to foster good clergymen. As mentioned, Carl’s parents, especially his mother, wanted him to become a priest. However, Carl had decided that he wanted to study botany and medicine. The two teachers mentioned above, Lannerus and Rothman, supported his scientific ambitions. In September 1726 Carl’s father went to Växjö to see how his dear son was doing. His dreams of his son joining the clergy were permanently dashed. Every teacher he asked declared that his son’s knowledge of the subjects needed for a career in the clergy was poor. They averred, obviously much to the dismay of the father, that Carl was much better suited for a career as a craftsman, in carpentry or tailoring, for example. In this disappointed and depressed mood, Carl’s father came to see Dr. Rothman. Rothman stated that the boy was indeed a poor student of theology and was ill suited for clerical studies, but that he would make an excellent physician. Rothman offered to board Carl in his own home, teach him physiology, and otherwise take him under his wing. And this is what happened. The mother took it badly, blaming it all on the family garden. She forbad her younger son Samuel ever to have anything to do with botany. Samuel became a clergyman.